I love squats. I squat every day, sometimes twice per day. I have celebrated birthdays, holidays, and even my wedding day by doing squat workouts. When I write training programs—whether for the advanced athlete or a beginner—you can bet the program will center on the squat. This approach isn't without issues. The first is that most people suffer from mobility issues. Their hips are frozen, their glutes and hamstrings are weak and inflexible, and their shoulders are so jacked that many can't even shelf a barbell on their backs. These people shouldn't squat, at least not until they take corrective action. The last thing we want to do is strengthen their dysfunctions. Fortunately, these individuals can still enjoy the full benefits of squatting by using single-leg movements to mimic that squat in different ways. These single-leg movements have the added benefits of reduced injury rates, reduced spinal compression, reduced knee pain, and improved stability. Of course, single-leg moves aren't just for the dysfunctional. Single-leg exercises engage smaller muscles like the abductors, gluteus medius, and quadratus lumborum in ways we can't duplicate training two legs at a time. This translates into more balanced growth and development. There is also a strong argument, made by strength coaches like Mike Boyle and others, that single-leg training has more carryover to sports than bilateral training. Whether you're a powerlifter, Olympic lifter, athlete, or bodybuilder, you can benefit from single-leg work. I train for powerlifting and strongman events. Many of my strongman movements, such as sled work and the farmer's walk, naturally incorporate single-leg training. These are tremendous movements with little to no eccentric component, which means you can recover faster and perform them more frequently. While my program is still loaded with bilateral movements, my sports-specific training, general physical preparedness (GPP), and recovery work are loaded with unilateral work. 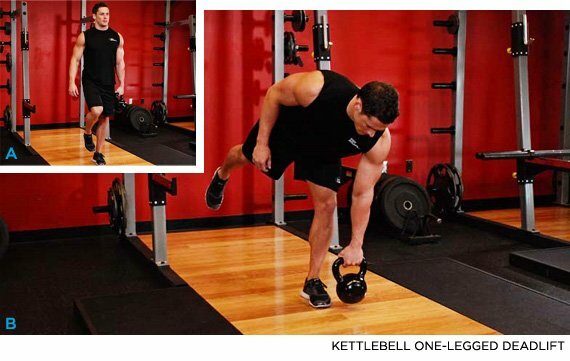 Whether you nix two-legged squatting motions altogether, or just incorporate single-leg training into your existing program, there is a place for getting on one foot. 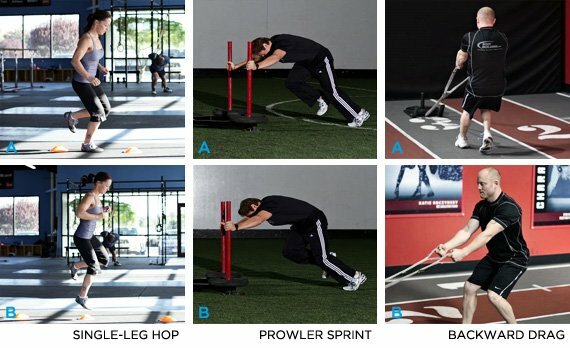 I divide single-leg training movements into three categories below, each of which includes some of my favorite examples. Use these as a base to incorporate one-leg exercises into your existing routine, or take my sample workouts for a single-leg spin. These should form the foundation of your unilateral leg workouts. 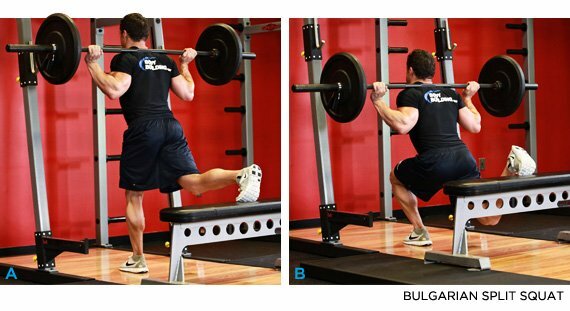 Semi-stable movements, like the split squat, place your "off" foot in contact with a surface to provide some stability. Your non-working leg provides some support, but isn't having any major effect in the primary movement itself. When we remove the support of the non-operative leg, we lose the stability it provided. This results in a much higher degree of difficulty. Coordination, balance, and stabilization of the femur are radically challenged. This usually also results in a reduction of range of motion—any compensation for incorrect movement may result in failure of the movement. The load may need to be reduced as well. While most of these types of movements could technically be classified as unstable leg movements, I place them in a separate category due to their specificity and dynamic nature.